Former Defense Minister Moshe Ya'alon, who joined his Telem party with Benny Gantz's Israel Resilience party, attacks the Netanyahu government and explains why he joined a party some of whose members belong to the leftist camp. "Prophecy was given over to fools but we're working to be the leading list," Ya'alon said at the Jerusalem Conference when asked how many Knesset seats would be awarded to Israel Resilience. "At the moment, the list is based on two parties, Israel Resilience and Telem. It's possible that by the 21st of the month maybe an agreement will be signed with another party. Our goal, of course, is to form a government. According to him, the defense minister has great influence on IDF conduct and military activity: "There are those who for their own reasons prefer to hide behind the army for political purposes, and some who remove the cloak of ambiguity for political purposes and bring us a warning from the Russians and force the Iranians and the Syrians to respond," he said. Ya'alon attacked cabinet ministers who in his opinion endanger state security by leaking cabinet meetings: "The cabinet since 2013 until now is something that shouldn't be. The Prime Minister must remove ministers whose conduct harms state security." Asked why he is sitting in the same party with Benny Gantz despite the differences between them, Ya'alon replied: "I'm not striving for peace? I'm dying for peace and for those who study wars aspire to peace. Is there a chance there will be peace? There's no chance. I also stood against the disengagement and the Oslo Accords. Benny Gantz isn't in a different place. The argument between Right and Left in the political arena isn't in these matters. Most of the people are moving rightward, and no one thinks there's room for more territories in exchange for peace. And therefore that's not the debate today. "Here the story is about loyalty to the State ("mamlachtiut"), and here there's no argument between me and Benny," Ya'alon explained. "I said that I'd never sit with Netanyahu whether or not there was an indictment, and Gantz said that he would sit with Netanyahu if an indictment is not filed. This is a good reason for us to win the elections, so we won't argue." Ya'alon reassured right-wing voters who fear the US President's Deal of the Century: "If Trump presents a plan for evacuating settlements, I'll remind you who sat on the fence to block the plan that Kerry submitted at the time. I blocked this plan and the cessation of IDF activity in Judea and Samaria. Gantz understands that too, because he was Chief of Staff. What do you think - he doesn't understand the security implications of this? There's no point in dealing with these matters as differences between Right and Left because there are no differences on these issues." 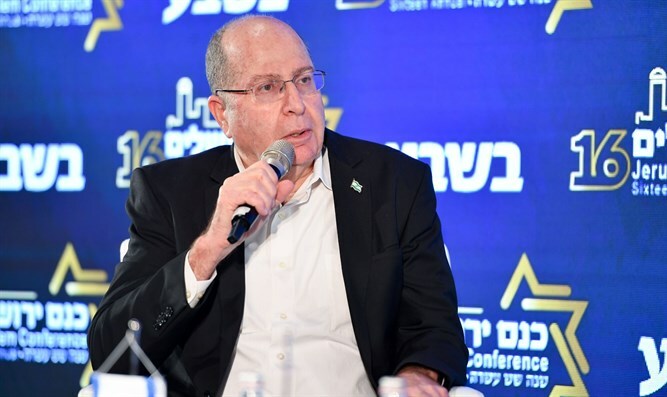 Ya'alon sees the release of Gilad Shalit, which he opposed, as the cause of the abduction of soldiers and holding their bodies: "The subject of the MIA is a very painful issue and I voted against the release of the prisoners. I remind you that Lieutenant Hadar Goldin is a member of my family. I think what needs to be done is to make holding the bodies a burden for Hamas instead of an asset."